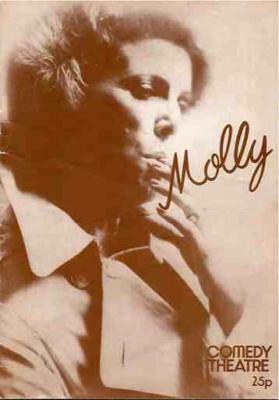 Molly was adapted from Simon Gray’s television play, Death of a Teddy Bear, which was based on the famous Alma Rattenbury murder trial. Molly is an adaptation for the stage of the earliest of my television plays – Death of a Teddy Bear –which was written for BBC’s Wednesday Play about ten years ago. 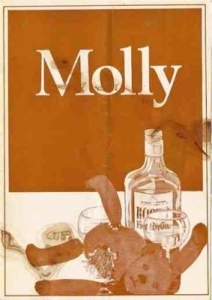 Brenda Bruce, Hywel Bennet, Rachel Kempson and the late Kenneth J. Warren played the original Molly, Oliver, Eve and Teddy; Warris Hussein was our director; Kenith Trodd the producer; and Gerald Savory wiped the tape. The source of Death of a Teddy Bear was the Alma Rattenbury case, an account of which I came across in a paperback called (I think) Ten Famous Trials, left discarded in a railway compartment. I was on my way from London to Cambridge to supervise Trinity undergraduates in (probably) Hobbes, or Hume, or Aeschylus or some such, and had a briefcase full of essays to mark. I flicked through the pages of the paperback – it was stained and swollen as if a dog had urinated over it – in the cursory manner of one who has something of more consequence on his mind, plucked out a handful of essays, and settled down to the book. When I arrived at Cambridge I left the book where I’d found it, but for the rest of that day, and for many subsequent days and (especially) nights, I was haunted by Mrs Rattenbury’s story –or what of it I could perceive behind the dozen pages or so in which her trial had been described. So when Kenith Trodd asked me if I’d like to try my hand at a full-length television play, the subject was already fully there, and at least partially shaped, even though unwritten. Which is perhaps why I didn’t go back to Mrs Rattenbury herself, neither to her trial nor to reconstructions of the crime. I based my play on the effect that the dozen pages had on me (the specifics being pretty well forgotten), changed the names, and hoped that my sense of the drama could find its own form. Death of a Teddy Bear was not, therefore, about Mrs Rattenbury and the murder in which she was involved, although of course without her it would never have been written. I felt strongly enough about Death of a Teddy Bear not to want to lose it to television – not realising that the BBC, after showing it twice, was simply going to chuck it away (see The New Review buy xanax 1 mg Vol. 3 No. 27) – and about five years ago I wrote the first stage draft. I followed as closely as I could the emotional line and basic structure of the original, extending some scenes and extracting those that depended on the mobility of the camera, and so inevitably, and against my intentions, altered the tone of the whole. Further drafts altered further, and I might have left the final draft in a drawer if it hadn’t been for the discovery that the television version no longer exists. So in a sense its recent production (at the new Spoleto Festival, in Charleston, last Spring) and its present slightly different (slightly re-written) production (at the Watford Palace Theatre) and its publication in The New Review must be attributed to ‘Wiper’ Savory, who left me with no alternative but to preserve the play in the only form now left. N.B. Terrence Rattigan’s play, Cause Celebre, now on in the West End, is also based on the Rattenbury case. I haven’t seen it, but gather that it started life as a radio play a couple of years back, and unlike Molly, concentrates on the trial. I believe there have been other Rattenbury plays, but have no details of them. “[I]t is Mr Gray’s version of the Rattenbury myth [rather than Rattigan’s Cause Celebre] that repays the more careful examination. Notice, as a tiny example, how the newly-hired Oliver persistently calls Molly ‘miss’, though she is married, and Eve’s ‘missus’, though she isn’t. Or observe the way Molly describes the boy when he’s frantically denying snitching her fags. He is, she says, ‘honking’ like a goose, a word that recurs again and again after she has seduced him and he is waiting in jittery expectation of her in the car outside. He honks and honk and honks, and the repetition makes a good metaphor for that callow but unstoppable sexuality, that farmyard hunger of his. But then the play is full of suggestive symbolism: a vision of seal pups being flayed alive, another of a wounded rabbit strung up by its legs and left to be worried to death by dogs. It has a resonance that makes Rattigan’s timbre sound just a little wolly. Molly is now available as a Faber Contemporary Classic in Simon Gray: Plays 2. To order a copy on special offer at 25% discount please contact Faber using code GRAYPLAYS. Or check out the plays section of our bookshop. For UK and Worldwide professional performance rights please contact Judy Daish Associates at judy@judydaish.com. For English-speaking amateur rights apply to Samuel French Ltd at www.samuelfrench-london.co.uk.